At 6’2″, 290, Texas A&M Center Mike Matthews was simply just not big enough to be considered one of the top centers in the 2016 NFL Draft. Scouts loved his tenacity, bloodlines (son of Bruce Matthews and brother of Jake Matthews), technique, and football IQ. He was expected to be a free agent- sign and stash/ long term project, to see what a team could develop out of him with a few years in the weight room. 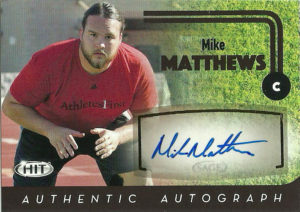 Mike signed with the Cleveland Browns after the draft, and was listed as the 3rd center on the team behind Cam Ewing and Garth Gerhart. He was a late cut in 2016, but in February 2017 Mike signed with Pittsburgh- unfortunately an injury late in training camp ended his season. Mike kept at it however, and in May of 2018, he signed with the Miami Dolphins who were looking for depth on the offensive line.